Trinidad and Tobago Women’s National Senior Team star forward and all-time record goal scorer, Kennya “Yaya” Cordner, revealed today that she refused to represent her country in World Cup qualifying action last night, after becoming disenchanted with head coach Shawn Cooper. Cordner was initially listed on the starting line-up for the Women Soca Warriors’ final Concacaf Women’s Championship group match against the United States in Cary, North Carolina; but was belatedly withdrawn from the team list. The Norway-based professional represented Trinidad and Tobago in their earlier outings against Panama and Mexico. She stayed on the field despite suffering a concussion in the second half against Panama and recovered faster than expected to again play through physical discomfort against Mexico. But she claimed the last straw was when Cooper opted, for the third successive match, to omit veteran defender Lauryn Hutchinson from the starting team—even after injuries ruled out three of his back four, Jenelle Cunningham, Patrice Superville and Arin King. Instead, Cooper turned to utility player Lianna Hinds and player/coach Ayana Russell, whose flitting between private players meetings and coaches’ conclaves—according to Cordner—was allegedly viewed with suspicion by some players in a tense team camp. Cordner believed Hutchinson was being victimised for her social media post, two weeks ago, which begged for support for the Women Warriors and claimed the team was worse off now than it was four years ago. Team manager Jinelle James subsequently asked Hutchinson to remove the post, which she did. But within the squad’s ranks, the veteran—who returned in August from a lengthy injury-enforced lay-off and played during the Caribbean Championship—became marginalised to the point that Cooper could not even find room for her in a makeshift defence. 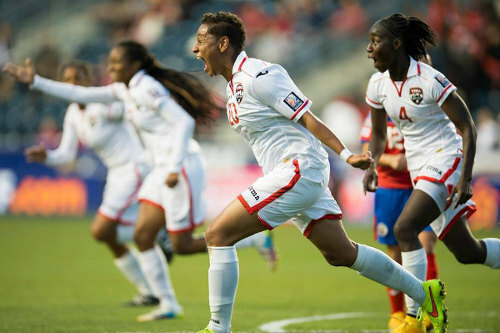 Photo: Trinidad and Tobago defender Lauryn Hutchinson (centre) screams for joy after scoring against Costa Rica in the 2014 Women’s CONCACAF Championship semifinal. At right is defender Rhea Belgrave. “I told them if [Russell] is starting and Lauryn [Hutchinson] is not, then I would not be playing,” Cordner told Wired868. “They were victimising Lauryn. One of the coaches went to Lauryn and said it is not because of the video we are not playing you, it was because we are unsure of your injury. And Lauryn said ‘you have got to be kidding me’. 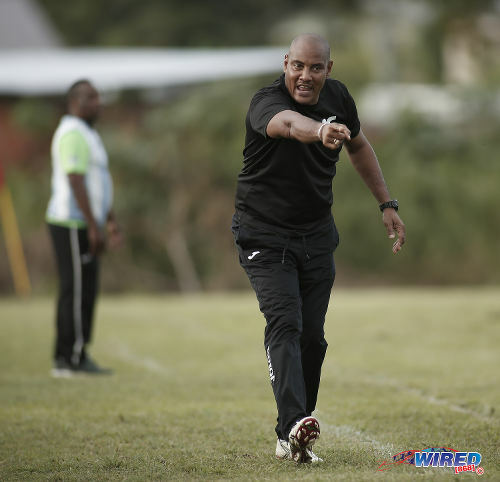 Cordner said the TTFA never put things in place for the Women Warriors to be competitive. But she also felt Cooper’s mannerism did not help lift the gloom. 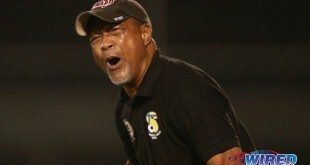 Although the players previously expressed their admiration for technical director Anton Corneal, there were reservations when they heard that Cooper—who was Corneal’s assistant to the Women’s Team during the Caribbean Championship in Jamaica—had taken over the role of temporary head coach. 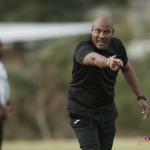 Photo: Trinidad and Tobago women’s coach Shawn Cooper shows his frustration during TTSL action for QPCC against Guaya United in Guayaguayare on 5 August 2018.
Cooper is a former Concacaf quarterfinalist as head coach of the Men’s National Under-17 Team and, at present, heads defending Secondary Schools Football League (SSFL) Premier Division champions, Presentation College (San Fernando). Before the Concacaf tournament, Cordner pleaded with Cooper to reinforce his team with more experience, including her former captain and friend, Maylee Attin-Johnson. First, Cooper insisted that he would only consider Attin-Johnson if she reached out to him, rather than the other way around. However, when the veteran player did so via What’s App, the coach never responded. “With that team they picked, they set us up to fail,” said Cordner. “Some coaches don’t like players who can stand up and let them know when they are wrong. He just wants to be the man in charge and the big bad wolf. “We had no depth [at the Concacaf Championship]. When you took out a player from the starting team, there was no one [of the same level] to replace her; and there was no leadership. 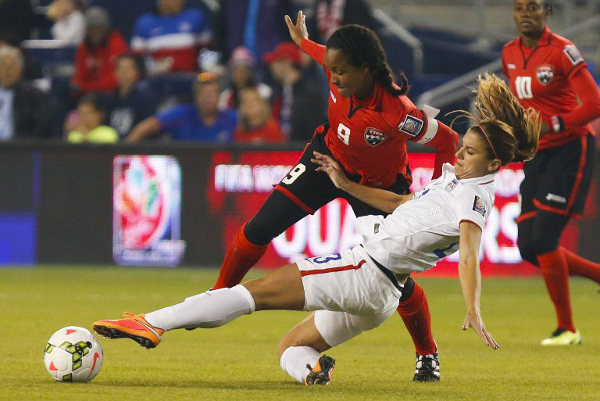 Photo: Trinidad and Tobago captain Maylee Attin-Johnson (left) tussles with United States attacker Alex Morgan (centre) while Tasha St Louis looks on in Kansas City. 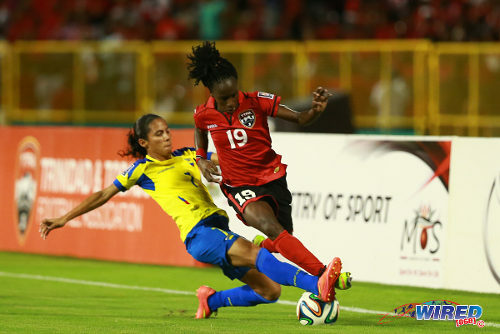 Trinidad and Tobago lost its 2014 CONCACAF opener 1-0. If the players were unsure about Cooper before they headed to North Carolina, skepticism turned to resentment when he took a pop at American coach Randy Waldrum, who led the team to within a whisker of the Canada 2015 World Cup and remains popular with the group. 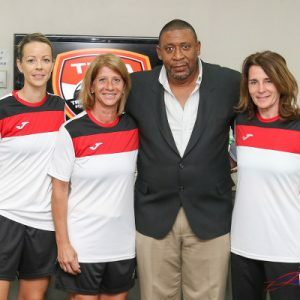 Cooper got his hands on Waldrum’s job application to the TTFA, in which the Texan stressed that the Women Warriors could not hope to match years of preparation by the United States and Mexico with a two-week camp. So, the Texan effectively said he was interested in coaching the team after the 2018 Concacaf Championship. There was a caveat though. “As for the timing, I’d look at this right away as you are in need immediately,” said Waldrum. Before their first full training session in North Carolina, Cooper read excerpts from Waldrum’s letter to the players. And, according to multiple sources, he allegedly said Waldrum abandoned the team and the players should be ashamed for begging him to return at Cooper’s expense. 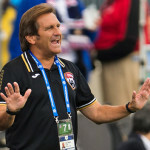 Photo: Then Trinidad and Tobago head coach Randy Waldrum (right) speaks to his players during a practice session in the United States in 2014. “Everybody’s mind was blown,” said Cordner. “He didn’t read the entire email; but he read part and then said ‘Randy has no hope for allyuh and want allyuh to fail’ and ‘the same man who allyuh want to coach allyuh wishing for allyuh to fail’. Cooper declined Wired868’s request for comment. However, Corneal and James confirmed that the head coach did read excerpts of the letter to the squad. James declined comment on Cooper’s recital, the non-selection of Hutchinson and Cordner’s refusal to play. But she did confess that the tour had been a draining experience for everyone. The Women Warriors threatened not to play at all against Mexico, due to the non-payment of stipends by the TTFA, only to change their minds after a players’ meeting. 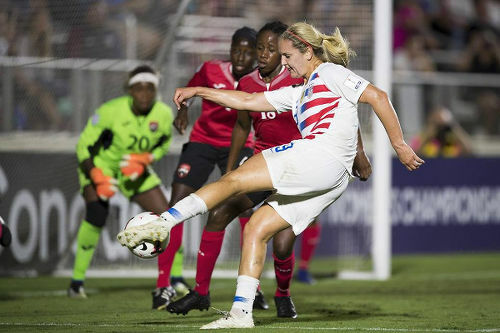 Photo: USA attacker Lindsey Horan (right) takes a crack at the Trinidad and Tobago goal during Concacaf Championship action on 10 October 2018. Corneal told Wired868 that he joined the team hours after Cooper read from Waldrum’s letter. Corneal insisted that only Cooper, as head coach, could explain the omission of Attin-Johnson and his reluctance to use Hutchinson. However, his opinion is that Hutchinson was merely usurped by a talented teenager with a bright future, Shadi Cecily Stoute. “There was nothing about victimisation from the video [in Hutchinson’s non-selection],” said Corneal. “Not at all. Personally, I like so many things about that girl as a person; [Hutchinson] is positive, upbeat, she has a lovely personality that is so consistent it is out of this world. Corneal stressed that the damage to Trinidad and Tobago’s France 2019 World Cup campaign happened long before Cooper was appointed as interim head coach. 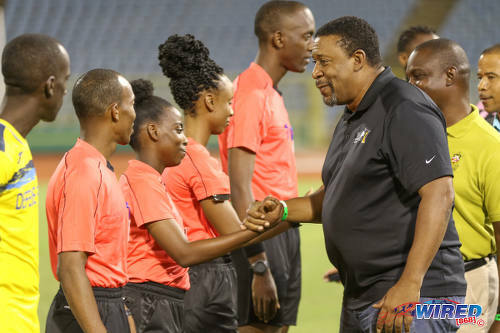 “Between [the] Jamaica [Caribbean Championship] and when we left, we barely had as many as eight players at our training sessions,” said Corneal, “so we couldn’t even play four vs four with goalkeepers. A lot of that was because the players were promised stipends and not paid; and they have commitments too and expectations. “What would have happened [to this campaign] if Jinelle [James] did not go to the Ministry of Sport seeking funding? “So we had eight players training in Trinidad and five players—Saundra Baron, Lauryn Hutchinson, Arin King, Liana Hinds and Jonelle Cato—training by themselves in Richmond. Is that ideal preparation to go into the final leg of World Cup qualification? The toxicity around the team, according to Cordner and Corneal, started at the top of the football administration. 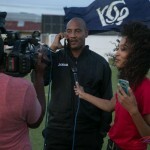 Both player and technical director claimed to be astounded that TTFA president David John-Williams was bragging about his controversial Home of Football project on TV6 at the same time his unpaid and ill-treated team were being hammered 7-0 by the United States; and at a time when virtually all national teams were on standstill with the football body unable or unwilling to settle debts to technical staff members. Corneal, incidentally, left the team before their final match for a pre-arranged engagement. So he was not present for the final in-house drama before kick off against the United States. “Even before I joined the team, I said I have to come back after the second game because of an appointment I had to honour,” said Corneal. “I tried to change appointment and I couldn’t; but it’s personal and I prefer not to divulge a lot. Ironically, Cooper put Hutchinson on the field to face USA after just 12 minutes, as Cato went down injured. And Hutchinson lasted 33 minutes before she asked to be replaced at the break, due to an ankle injury. 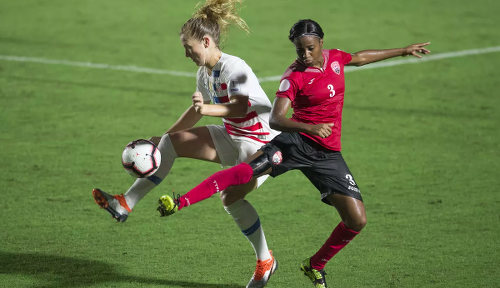 Photo: Trinidad and Tobago forward Mariah Shade (right) challenges a USA opponent for the ball during Concacaf Championship action on 10 October 2018. The Trinidad and Tobago outfit were little more than punching bags for the USA women. By the final whistle, the count read 52 shots to zero in favour of the host team who also had 75 percent possession and 510 passes to 111 from the Women Warriors. Cordner watched on from the stands. Her decision not to play could mean an inglorious exit from the international stage for the two-time Player of the Year—one of Trinidad and Tobago’s most gifted players of all time. After the final whistle, the Trinidad and Tobago players were allowed to keep their jerseys as a memento for their international service. Equipment manager Steve Frederick, according to Cordner, refused to give her a jersey. “[Frederick] told me ‘you don’t want to represent your country, well then you’re not taking any uniform here’,” said Cordner. “Well, let him keep his jersey; that’s okay. I am so disappointed with how they treated us going into this tournament, knowing that if we had the right backing, we could have done well. But it wasn’t for us. “I would speak my mind on any given day and nobody will make me hush my mouth, even if I have to be blacklisted. If we don’t speak out, they will continue to treat us like they do. 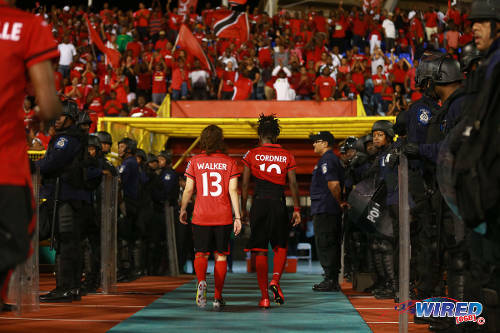 Photo: Trinidad and Tobago players Kennya Cordner (right) and Anique Walker head for the dressing room after their 1-0 FIFA 2015 Women’s Cup Play Off second leg defeat to Ecuador on 2 December 2014 in Port of Spain. “[…] And this not just the TTFA because the coaches deserve some of the blame too. They could have picked the best possible team to represent Trinidad and Tobago; and because of their egos, they did not. And now look where we are. In another newspaper it is reported that “ya ya” would be sanctioned for being a real human being. No problem. I hope they include the Board for infighting and dereliction of duty. The big bad wolf, The manager for breaking protocol to seek the welfare of the team. Corneal for abandoning the team to feed his family. DJW for spending time on the home for football when we don’t have any football. And while they are at it sanction the ‘rude’ minister who gave all that money without getting the details. Would she be asking for a report or continue the windfall. Teams should apply for funding 6 months in advance with proper preparation and management in place. If they can’t run their house run them from your house. Gyurl, yuh real brave! 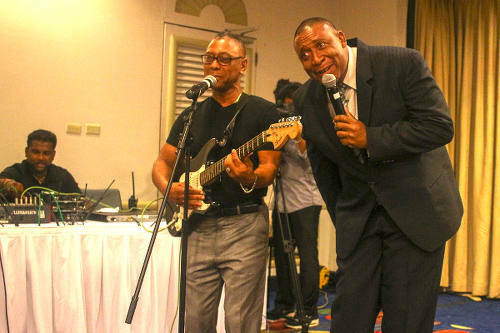 Yuh want the Prime Minister and the Minister of Everything to call yuh unpatriotic? How yuh could say all dem true-true ting fuh people to know what does go on behind the scenes? She’s a disgrace to her country. All the right ingredients for a perfect recipe of failure and indiscipline, If no one takes these types of actions and stand up we’ll continue to get the results we deserve.